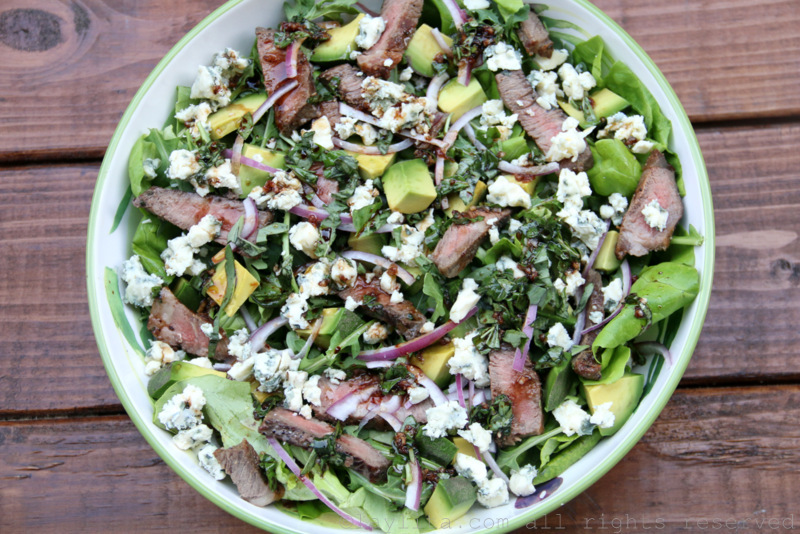 This steak salad with blue cheese, avocado and basil balsamic dressing is another one of my quick lunch/dinner recipes using leftovers. We had a leftover steak from a recent lunch that my husband prepared. Our options as we were preparing dinner the following evening were to either divide it into four small pieces so we could each have a small taste or incorporate it into another dish. I love adding leftover meat/fish to salads. We had some perfectly ripe avocados plus some blue cheese, all of which would work great in a salad. 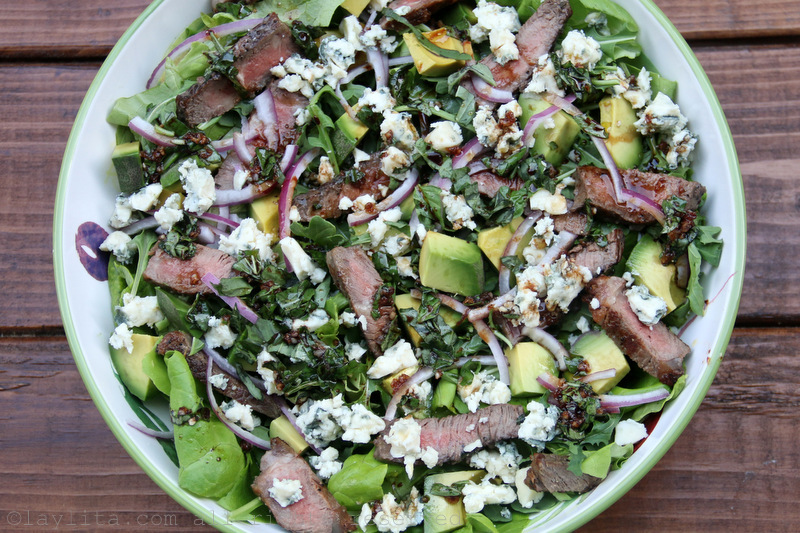 I love the flavor mix of avocado, blue cheese, red onions, basil, and balsamic vinegar. And adding strips of leftover juicy NY strip steak made it even better. 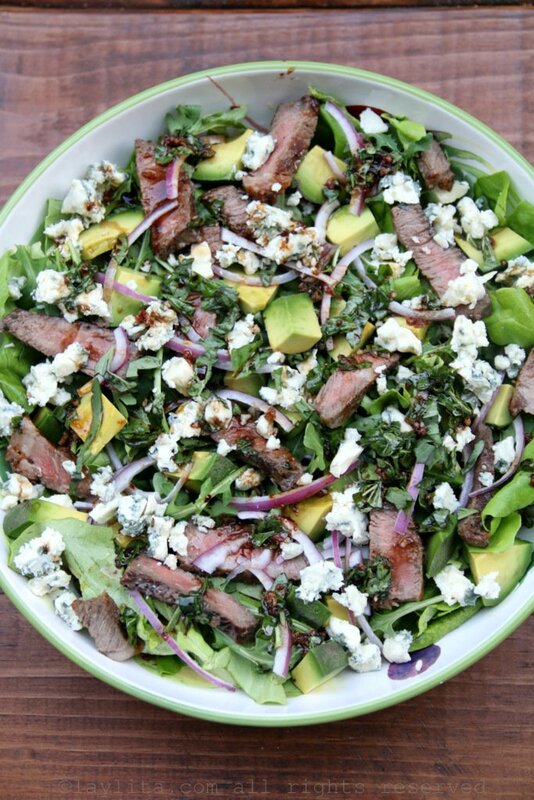 Delicious recipe for steak salad with blue cheese, avocado and basil balsamic dressing, made with grilled or seared beef, diced avocado, crumbled blue cheese, red onions and a basil balsamic salad dressing. To prepare the basil balsamic salad dressing, place the ingredients in a small bowl and whisk lightly. 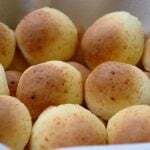 Can be made ahead of time, refrigerate until ready to use. 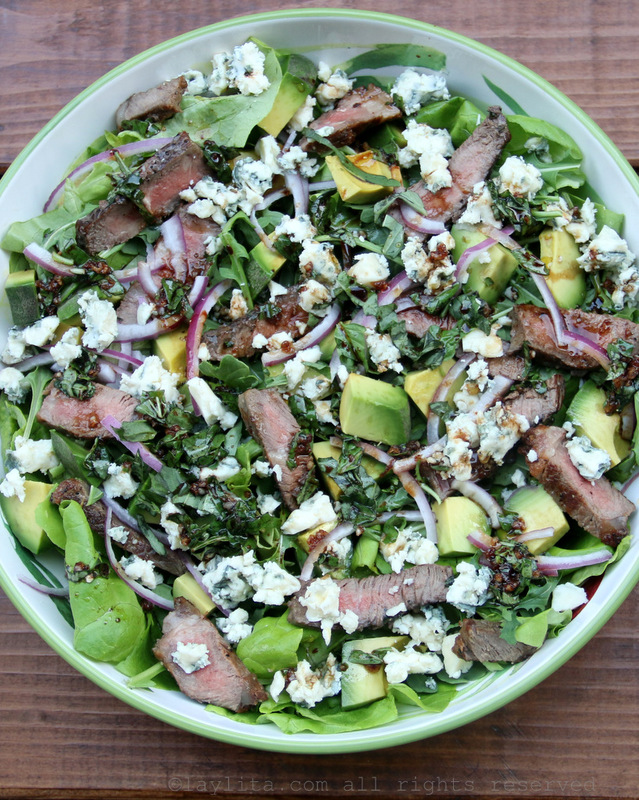 To prepare the salad, place the salad greens in a salad bowl, add the diced avocado, red onion slices, steak strips, crumbled blue cheese, and the chopped basil. Sprinkle the balsamic dressing over the salad, toss and serve immediately. 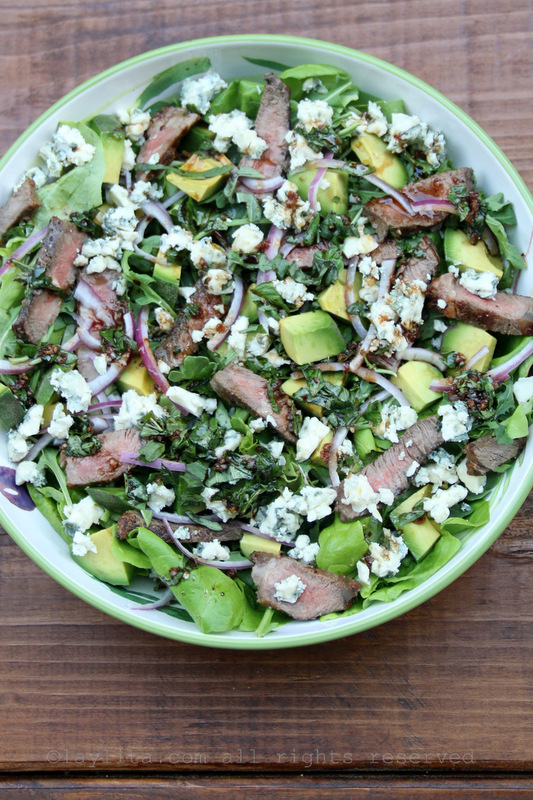 This leftover steak salad recipe is also very easy to adjust and customize based on what you have available in your fridge and also based on your taste preferences. I used basil for the dressing and also added chopped basil leaves to the salad, but you can easily replace the basil with cilantro or parsley. If you aren’t a blue cheese fan, or just don’t have any in stock, then you can also use feta, goat cheese or queso fresco. You can also add additional vegetables such as sliced cucumbers, tomatoes, radishes, or anything else that you would like. 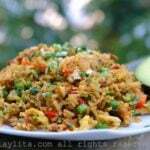 This salad can be served as a small starter or side salad for 4 people, or as main lunch salad for 2 people. Super duper!! Left over steak/roast was an issue. No longer! Fantastic! Thank you! Used cheddar cheese, I had it on hand. Delish! Really good salad. 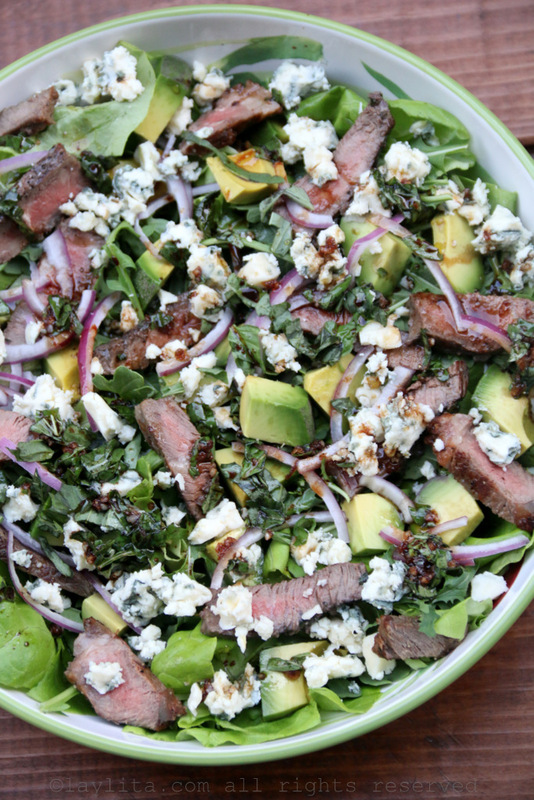 We used skirt steak — quick to grill, very flavorful. We have added it to our 5-Star List! Made this tonight. Hit it out of the park!